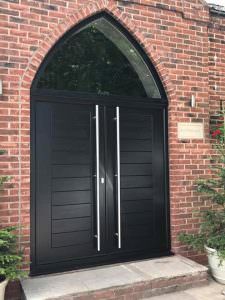 Composite doors come with a long list of advantages and benefits for the homeowner that is looking to replace or install new doors into their property. Often customers find themselves choosing between uPVC doors and composite doors, weighing up the features each provide and working out what is the best cost-effective solution. The first advantage that Endurance composite doors have over uPVC or traditional timber is the strong and sturdy profile. Created using a mixture of materials, each purposefully selected for their unique properties, the composite door results in a superior profile that is unrivalled by uPVC or wood. Created with a mixture of uPVC, laminated door skin with a weather proof and durable acrylic layer and our solid timber core, the Endurance composite door range offers advantages beyond its counterparts available on the market. One of the largest advantages of composite doors over uPVC or wooden doors is the range of styles, designs and options available. Whether you’re looking for a traditional design for a more conventional home or you would prefer a contemporary style design for a modern property, Endurance has the perfect composite door for you. The Country Collection features traditional shiplap styles that look stunning in earthy tones inspired by nature. Take a look at ‘Irish Oak,’ ‘Racing Green,’ and ‘Walnut’ in particular for beautiful composite doors that make an incredible first impression. Many of the doors available in our Country Collection are available as stable doors, offering a versatile and flexible design that is bound to impress. The Urban Collection features modern designs that can make a statement and improve the overall aesthetic of your home. With stainless steel pull handles and striking glass designs to choose from, you can sculpt a bespoke composite door solution for your home that is unique to your personal taste. Our Urban Collection composite doors look particularly good in bright, bold colours that make a statement. The Classic Collection is inspired by the Victorian and Georgian eras, featuring traditional designs packed with modern functionality. Our entire composite door range is available in our 17 colours with the option for matching coloured frames to suit your home. Our doors work well as front doors but are also suited as rear doors or internal doors for your home. Our composite doors will benefit your home as soon as they are installed, trapping warm air inside of your home and keeping it warmer for longer. This in turn helps to lower your energy bills as you find less of a reliance on the central heating, helping to decrease your carbon footprint at the same time. Windows and doors are the most common places that homeowners suffer with heat loss, which is why our composite doors work to eliminate draughts and water ingress. Your home is well protected even in the most adverse of weather conditions giving you complete peace of mind about the protection of your home from the outside. Another advantage of our composite doors is the excellent levels of security they provide. The robust nature of the profile and the unique solid timber core our doors are created with result in a composite door that is able to withstand even the most persistent burglar. Our doors have even been proven to be sledgehammer proof! Coupled with the ATK 3 star diamond cylinder, your home is completely secure, protecting your family and property from harm. You’ll be confident that your composite doors are working well to secure your home with each door Secured by Design accredited. Our composite doors are created using high end and advanced manufacturing techniques resulting in a profile that is unrivalled anywhere else on the market. Renowned for their solidity, our 48mm thick solid timber door slab is 10% thicker than other composite doors that are available. It makes sense why our Endurance composite door range is so popular! Our composite doors offer a low maintenance solution that won’t cost time or money to upkeep. All they require is a simple wipe down from time to time with a hot soapy cloth, to maintain the pristine look of them. Another advantage of the composite door is that it won’t fade over time, so our rich and colourful woodgrains will maintain their brightness even after years of exposure to adverse weather and frequent use. The Endurance composite door range is versatile and flexible with cost-effective and budget-friendly prices. Our expert team can advise and recommend on the best possible solution and you can design your door on our online designer tool to envision exactly how you want your composite doors to look. If you have any questions or queries about any of our composite doors or you’d like more information, simply get in touch to discuss your requirements.